Sieves can often look alike, but take a closer look and you'll find they are not all the same. In fact there can be some very important differences that may affect the results, performance or life of the sieve. The illustration below shows some of the important features of an Endecotts sieve and gives a good idea of what to look for whenever you specify or reorder. Endecotts test sieves are of the highest quality and are designed for accurate and efficient particle analysis. Endecotts test sieves can be supplied in a variety of different inspection levels depending on the information requirements specified. Certified Test Sieves - All test sieves manufactured to a National or International Specification are supplied with a Certificate of Compliance and individually serial numberedto provide full traceability. Inspected Test Sieves - Test sieves inspected in accordance with the procedures listed in clause 5.2 and table 4 column 2 & 3 of ISO 3310: BS410-1:2000. Each sieve is supplied with an inspection Certificate stating separately the values for the average aperture in both the warp and weft direction of the wirecloth. Calibrated Test Sieves - Test sieves inspected and calibrated in accordance with procedures listed in clause 5.2 and table 4 column 4 & 5 of ISO 3310: BS410-1:2000. Each sieve is supplied with a calibration certificate recording the number of aperture and wire diameters measured, the average aperture size and standard deviation separately for the warp and weft direction. The type of weave will also be stated. Matched Sieves - Two or more test sieves each fitted with a sieving medium having similar aperture characteristics. Each is supplied with a Certificate marked "Matched with sieve serial No ..."
Mid Point Sieves - Test sieves with the sieving medium specification tolerances reduced by 30%. Each sieve is supplied with a Calibration Certificate giving the range of tolerances and measurements taken. Re-Inspection Service - Used sieves are examined and inspected in accordance with the appropriate specification. 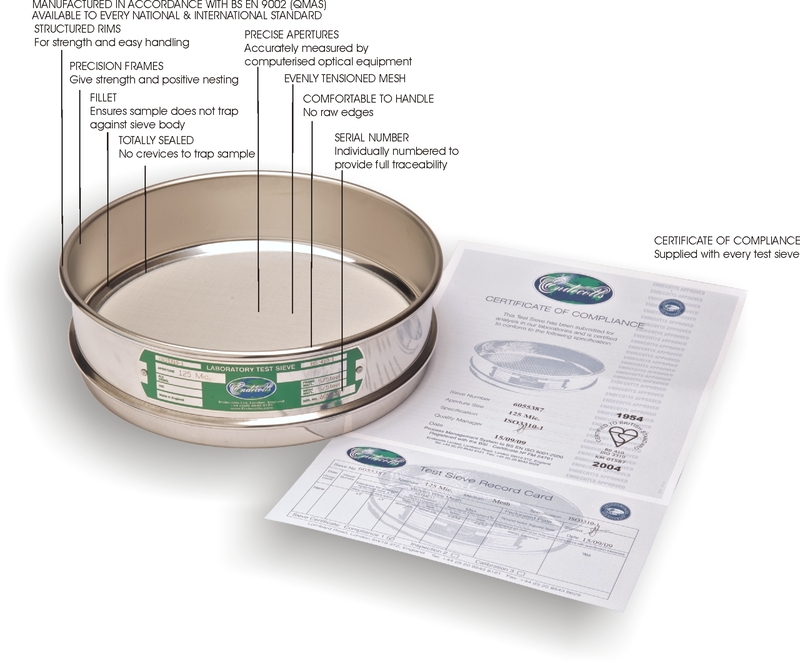 Complying sieves are issued with a Compliance, Inspection or Calibration Certificate as requested by the customer.